Cape Town – To encourage users to save water, the Cape Town City Council has set up a Facebook page to enable consumers to log complaints. But it hasn’t worked out quite the way the City might have envisaged – numerous people are accusing it of taking too long to respond to messages, saying their problems have been ignored for weeks at a time. But the City says it acts on complaints as quickly as it can. Fred Fraser wrote about a park in Clarendon Street, on the corner of Piet Retief Square in Ysterplaat, where he says the park keeper switches on the sprinklers at 8am and lets them run until just after midday, “from Monday to Friday”. He asks why someone from the water department cannot speak to the park keeper to explain about saving water. Acting mayoral committee member for utility services Xanthea Limberg replied that the City attended to all complaints as soon as resources allowed it to do so. But user Michelle Adams disputed her explanation. She wrote that she had reported leaking pipes in Ocean View’s Robin Circle three weeks ago. 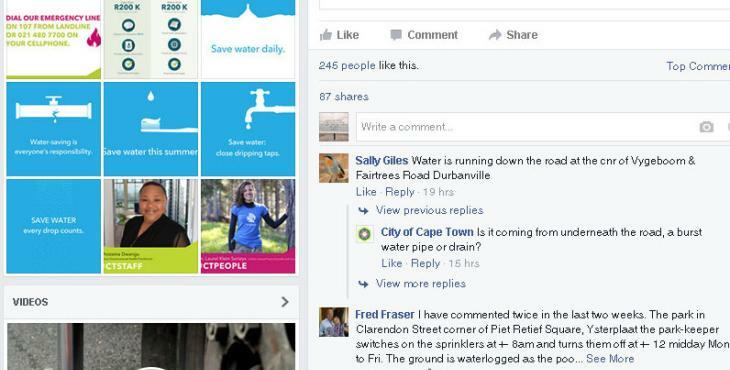 And Craig Crown said he had been complaining about leaking valves in Aiken Road, Norfolk Park, “for weeks”. City spokesperson Priya Reddy admitted that in some cases there was not enough manpower to attend to a leaky valve or a faulty water meter immediately. “We operate a massive network over 10 000km long and we service over 3 million people. Complaints are referred to a relevant depot and the customer is provided with a phone number to which he can follow up, said Reddy. Limberg said the City was considering implementing low-level water restrictions. She said said this would be part of normal water demand management and would be implemented as a precautionary measure to avoid the need for far more rigorous restrictions next summer, if there is another dry winter.